Rob Tapert at the 1998 Burbank Convention. Despite the expressed intention to deconstruct Xena in the third season of Xena: Warrior Princess (XWP), I would argue that Mr. Tapert has overlooked some crucial psychological dynamics of audience reaction. Given the choice between accepting a change in message or a change in the hero, an audience will instinctively opt for a changed message. In this tale, Xena is that heroic constant who serves as the conduit to the divine powers. Traditionally it is her myth which illuminates the moral, not vice versa. It is not surprising, therefore, to find that in the third season, many fans, rather than change their concepts about the hero (who must always be right), have accepted a new crusade, that of seeking revenge instead of redemption. It is because of this tendency (which is applicable to any heroic tale) that any attempt to "deconstruct the hero" leaves no room for moral ambiguity or relativism in the tale-telling. The audience should not be left wondering whether or not the hero's actions were right or wrong, because we will instinctively assume the hero took the correct course. It is a given which can only be shaken if the audience is willing to change the POV (point of view) and cast themselves in the role of hero (redeemer). But what of Gabrielle's role in XWP? To me, she serves as the "Everywoman" in the tale, a role which, by its very purpose, is not heroic in the traditional sense. As Xena serves as conduit to the divine powers (manifested by her connection with Ares and the Olympians), so the "Everywoman" serves as the audience's touchstone to the hero. She is (1) the channel to or intermediary between "us" and the semi-divine hero, (2) our entryway into the myth, and (3) the disciple to a redeemer who is the earthly representative of divine power and knowledge. From a Judeo-Christian perspective, Gabrielle plays the Job role, or, perhaps more appropriately, the Peter or the Judas role: an initiate who is not only worshiper and chronicler, but flawed apostle who can also be the betrayer. Given the choice between whether the apostle or the redeemer took the correct course of action, the apostle will always lose. So if we as audience are to accept the notion that Gabrielle could be equally heroic (or unheroic, as the case may be), we either have to elevate the status of the human Gabrielle or subvert the status of Xena, the semi-divine. In other words, we must adopt a more humanistic view of the tale. This is rather difficult to accomplish within the metaphysical or allegorical framework of a myth, which requires a hero. And heroes are not known as the chroniclers of their own myth. In an ironic forshadowing of times to come, Gabrielle protects Pandora's child from harm in CRADLE OF HOPE. This imbalance places an extraordinary burden of guilt on the character of Gabrielle. The audience assumes that Xena the hero must be right, whereas Gabrielle must be proven to be right, especially if the struggle is specifically between these two archetypal characters. There can be no room for ambiguity regarding who is right or wrong in a given situation or Gabrielle will always bear the blame, regardless of whether the audience must accept a changed message in order to accommodate a blameless, or at least already forgiven, hero. Gabrielle's character is additionally burdened by shouldering the role of the feminine archetype, the Pandora or Eve who permits evil to enter the world. This is a role assigned all too often to women throughout mankind's religions and mythologies, and once painted as the bearer of ultimate sin, the image is one that is nearly impossible to erase. It is not a stereotype one would have expected to see in XWP. Xena: You lied to me. Hope: My father's kingdom is at hand. Well, now, that certainly was unambiguous. Gabrielle's blame was predetermined before the audience even saw the episode. Problem is, in order to accept the fact that Gabrielle's decision to save her daughter's life was the wrong choice, we must also accept that Xena's attempted infanticide in GABRIELLE'S HOPE (51/305) was the correct course of action. This would seem like a no-brainer (considering that most of us would assume that infanticide is wrong), but in order to maintain Xena's heroic status, the moral messages must be twisted to suit the situation. It was Gabrielle who committed the ultimate sin by doubting the hero , which she admitted in that last scene in MATERNAL INSTINCTS (57/311), thus illustrating that anyone who doubts the hero will be proven wrong in the end. Conversely, we have not been presented with any dire consequences or confessions arising from Xena's actions, whether that be the murder of Ming T'ien, attempted infanticide, forcing Gabrielle to abandon her daughter, or even torturing the bard and attempting to murder her. We have no teary admissions of guilt or self-doubt from Xena regarding her obsessive pursuit of revenge against Caesar in THE DELIVERER (50/304) or WHEN IN ROME... (62/316), no repercussions arising from the assassination of Ming T'ien, and no regrets about dragging Gabrielle behind a horse. 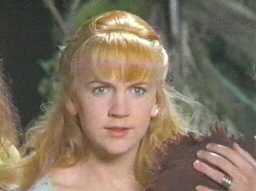 There are no consequences to Xena's actions since even Gabrielle's cuts and bruises miraculously disappear by the end of THE BITTER SUITE (58/312). Unlike Gabrielle, who is forced not only to deal with the consequences of her actions but question her motivations in episodes such as MATERNAL INSTINCTS (57/311), WHEN IN ROME (62/316) or FORGET ME NOT (63/317), there is no corresponding indication that Xena has anything to feel sorry about. The closest we came to witnessing a clue that Xena may have done something wrong was in THE BITTER SUITE (58/312), when she confessed to hiding the truth about killing Ming T'ien. Yet, there was no acknowledgment that the deed itself may have been the wrong course of action. Ergo, Xena's actions are justified by the omission of consequences. But is Xena not a mass murderer, a pillaging warlord, a thief, and a liar? Yes, we are all quite aware that Xena was a bad, bad grrl in her past, and we have seen enough that there is little the writers could do to shock us in that regard. But in order for us to have accepted Xena as the hero of this tale, we had to have forgiven her past transgressions already, thus reminding us of her misdeeds via backstories is not as much a deconstruction of Xena as it is mere explanation. And we the audience have already detached ourselves emotionally from her past crimes. In addition, for Xena's every nasty deed there is a juxtaposition of a suffering Xena. She is crucified several times, crippled, beaten, hunted, etc., etc. These kinds of images are meant to foster sympathy, not deconstruct, which I interpreted Mr. Tapert's meaning as "knocking down a peg on the hero ladder". Since we have already forgiven Xena her sins, it is her suffering that plays most on the audience. Consequently, any character is automatically cast in the role of villain to Xena's rising saint. In the end, what we are left with is the impression that only Xena deserves redemption, despite the fact that her crimes were just as bad as, if not considerably worse than, those around her. Sinners such as Ming T'ien, Hope and Crassus are not offered a chance to redeem themselves; not by the audience, not by Xena, and not even by Gabrielle. To a great extent Xena's crimes have been depersonalized, and not only by the passage of time. The Warrior Princess and her army may have slaughtered thousands, but by and large her victims are nameless and faceless. Even in her backstories we have seen only a handful of dead soldiers or a nasty despot here and there. What we have not seen are the thousands of widows and orphans she created, or the innocent villagers left dead or starving in her wake. DREAMWORKER (03/103) was the exception in that regard, but Xena's backstory has had quite a whitewashing since then. The marvelous possibilities of Callisto's character began to wane when some doubt was raised regarding Xena's culpability in the death of her family at Cirra. Who now will remind us just why Xena carries this burden of guilt or why Xena's journey of redemption is central to the epic of XWP? On the other hand, the presumption of Gabrielle's guilt has been continually reinforced in the episodes themselves this season. We have heard or witnessed on almost a weekly basis Gabrielle blaming herself or confessing to self-hatred, both for her motivations and for her decisions. Unlike Xena's faceless victims, Gabrielle's perceived mistakes directly involve Xena. Either Gabrielle lies to Xena, or betrays Xena, or "hurts Xena's feelings," etc. Even an act of compassion, such as saving her own daughter's life, is revealed as naive optimism for which Xena will ultimately pay the price. Gabrielle takes the poison-spiked waterskin from Hope's still fingers in MATERNAL INSTINCTS. What we are left with is not the deconstruction of Xena but that of Gabrielle, who, unlike the hero afforded the grace of divine purpose, is left with little more than mortal despair. The bard no longer serves as the conscience or moral guide, and she has lost her role in this tale as the voice of reason and touchstone for the hero. Should it be surprising, then, that many in the audience feel disenfranchised by the third season? If Gabrielle as "Everywoman" is portrayed as undeserving of the hero and foolishly optimistic, then faith in ourselves has been revealed as flawed. If Gabrielle's idealism and belief in goodness is destroyed, so is our own. The only alternative is to adopt the pessimistic philosophy that evil will ultimately conquer good; that the cycle of revenge cannot and should not be stopped; and, that expressions of rage are more valid, or at least more practical, than those of compassion. This is indeed a strange interpretation of Greek tragedy, unless the Xenastaff has adopted the sophists' view that justice is merely the interest of the superior and stronger (might makes right), and that this doctrine is not only the natural order, but that the stronger, having prevailed over the weaker, should, in the words of Callicles, indulge their desires to the fullest. In the end, what we as viewers are left with is an heroic tale in desperate need of heroes. Mr. & Mrs. Maynard raised their puppet to be a good citizen, which of course meant that as soon as she was old enough, she hopped a train to art school where she aspired to become a thorn in the side of society. But after eight years of these shenanigans, the puppet became bored and decided to do something totally different. So this time she hopped in her pickup truck and drove to Virginny and became a machinist in the shipyards. It sure was different. She did that for ten years, and came away secure in the knowledge that she will never, ever take a vacation on a cruise ship. Now she lives in the Blue Ridge Mountains with: Carmen, a writer and stereotypical intellectual-type; two Scotties, Annie and Fergus; a collie- mutt named Bonnie; and a very prickly cat named K'Ehleyr. The puppet does what she d*mn well pleases these days, including freelance art thingies and writing thingies, like covering the local loonies for small-town newspapers. That's about all anyone needs to know. Oh, and you can always find me hangin' out on the MacGab mailing list. Favorite episode: THE GREATER GOOD (21/121); THE QUEST ; DREAMWORKER (03/103). No, Steven Sears did not pay me to write this, although a gratuity *is* customary. Least favorite episode: WARRIOR...PRIESTESS...TRAMP (30/206), or any episode featuring Joxer and/or Meg, the Tagamet twins.